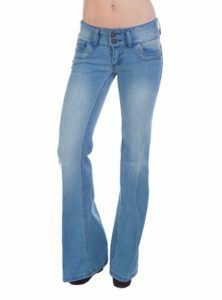 Those with a slim rectangle body shape (ruler body shape) can wear a wide range of the types of jeans for women with ease. This body type has fewer issues navigating the vagaries of fashion. 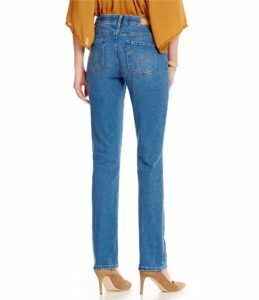 From high-waist to low-rise jeans, from flare or straight cut to skinny silhouettes, those with a slimmer body type usually do not struggle with jean fit issues. But there are a few tips that can flatter a slimmer figure and add curves. If you have a wide rectangle body type (brick body type) there are style tips that can add curves and elongate your figure. The shoulders and hips are about equal width. Also referred to as a ruler shape, can be “boyish” in that this figure is slim and isn’t curvy. This body type can also be more “brick”-like in proportions – broader than the ruler and with heavier legs. Slim fit jeans with a straight waistband work well for rectangle/ruler figures. 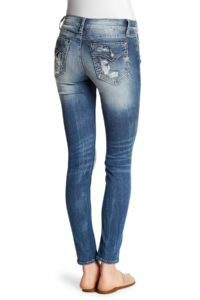 A curved or contoured waistband allows gapping at the waist and jeans designed for curvier figures can be baggy in the seat. 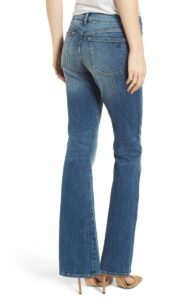 For those with a flatter tush, fading on the seat of jeans and curved yokes will make you seem curvier. 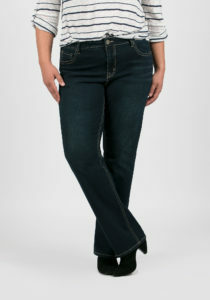 Jeans back pocket design can also make you bottom appear rounder. Flap back pockets, back pockets that are embellished and back pockets with added details such as stitching will add volume to your backside and make you seem curvier. If you have a rectangular but heavier, brick shape, tapered or tight fitting jeans can make you appear top-heavy. 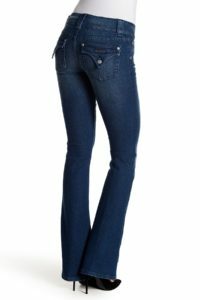 If you want to appear curvier, steer clear of jeans that fall too high on your waist because this will emphasize a boxier shape. 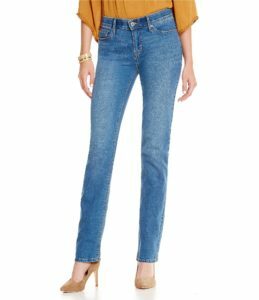 To make you appear longer and leaner, pair dark wash jeans with heels or wedge shoes. If the shoes are flesh toned or if the heels are the same color as the jeans and the hem of the jeans covers most of the shoes, the elongation is especially effective. 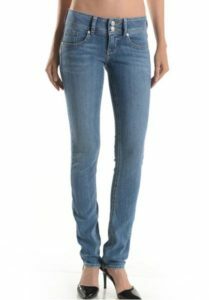 If you have a rectangular, boyish figure, a jean that flares below the knee can make you seem curvier. 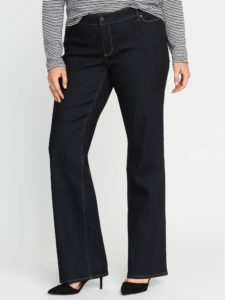 For those with slender legs, whiskering or fading on the front thigh of jeans (and fading on the seat of jeans) can add the illusion of curves. 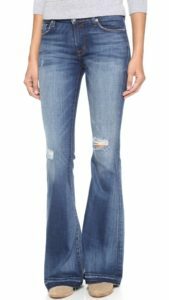 Low-rise jeans that sit on the hip and have a wide waistband can make your narrow hips appear wider and therefore curvier. A wide belt worn at hip level will also emphasize your hips and make you look curvier.